Order your Casio PXS1000 Digital Piano from AMS and enjoy 0% Interest Payment Plans, Free Shipping, Free Extended Warranty & 45 Day Money Back Guarantee. Grand elegance and a stunning touch! Delivering a pure piano experience, the PX-S1000 features an authentic fully weighted Smart Scaled hammer action keyboard in a striking design. Created for inspiration in any room, the PX-S1000 features 18 tones, including a breathtaking stereo grand piano, stereo speakers, 2 headphone and 1/4" outputs, USB port, Bluetooth compatibility and included power supply. The PX-S1000’s striking design fits any room, any decor, and any mood. Available in either black or white finish, its sleek, glossy panel and unibody case evokes a luxurious acoustic grand, in a gorgeous case that’s barely larger than the keys themselves. There’s never been a keyboard this slim that feels this good. The superior touch of the PX-S1000 is thanks to the newly designed fully weighted Smart Scaled Hammer Action Keyboard, which delivers an authentic and uncompromising piano touch with an incredibly small footprint. 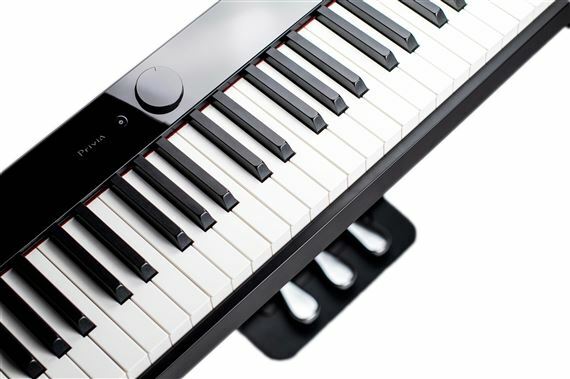 Casio’s proprietary key scaling system reproduces the individual characteristics of each of the 88 keys, while ebony and ivory key textures ensure confident playing in any climate. The PX-S1000 includes 18 Tones including a breathtaking acoustic grand piano. Advanced string resonance exposes the harmonic relationships between vibrating strings, while damper resonance adds depth and richness. You’ll even hear the damper rise and fall when the pedal is pressed, along with the subtle mechanical sound of the keys being played and returning to their original position. Hammer response and key-off simulation deliver even greater detail, reacting naturally to your playing dynamics. Along with piano, you’ll also find lifelike tine and reed electric pianos, organs, strings, vibraphone, harpsichord and more. Privia pianos are already known for replicating grand piano sound and feel in a compact package, but the PX-S1000 will make you rethink how portable a piano can be. It’s 43% smaller than previous generation Privias and takes up literally less than half as much space as its competition, while retaining true piano touch and sound. It goes anywhere you need a piano: On a table, on a counter, on a desk, on your bed, the list goes on. Weighing under 25 pounds and with optional 6xAA battery power, the possibilities are endless. Download the free Chordana Play for Piano app (available on Google Play and the iTunes Store) and customize your PX-S1000 to suit your mood. Change instrument settings, control the MIDI recorder, and interact with MIDI files from your favorite device. View PDF scores, and use the optional SP-34 3-pedal unit (or third-party Bluetooth-compatible pedals) to turn pages when playing.